Luxor is proud to present its new tablet charging and storage unit, the LLTMW12G. 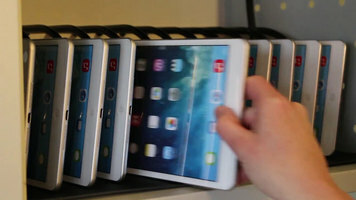 It is 19" wide, 13" deep, and 14" high and can accommodate up to 12 devices. It has a weight capacity of 30 lb. 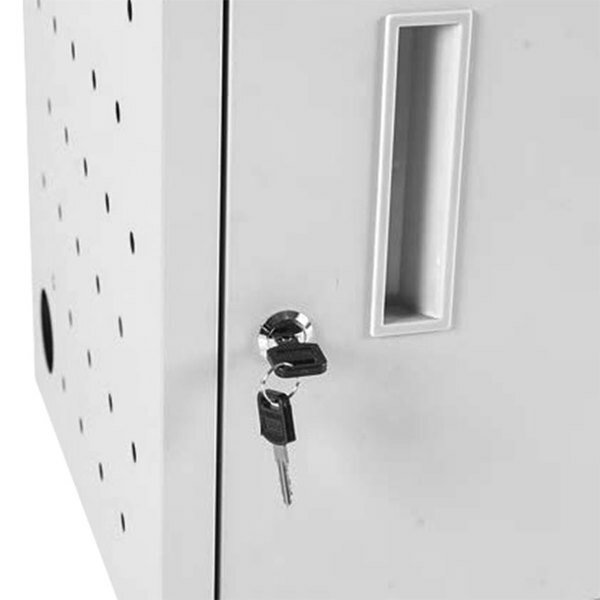 Rubber-coated dividers, spaced 1" apart, keep your equipment organized and protected. 12 electrical outlets keep the devices stored in the unit fully charged. The side panels are ventilated to allow air to circulate freely through the unit. It comes fully assembled and includes mounting hardware. Its compact size also makes it perfect for desktop applications. For the perfect tablet storage and charging solution, choose Luxor's LLTMW12G. Looking for an all-in-one storage unit and charging station for your laptops, tablets, or other hand held devices? Check out this video to learn about Luxor's LLTMW12G wall mount/desktop charging station! Can I leave the case on my device while charging it in this unit? This depends on your unit and the type of case you have. Luxor’s LLTM series features slimmer shelves that are perfect for tablets, while their LLTP units are ideal for laptops. 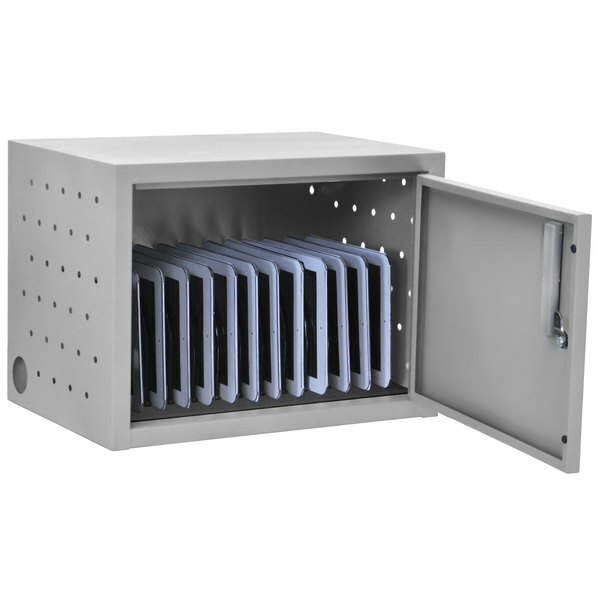 While these can be used with very slim, streamlined cases, we would advise making sure that the unit has enough airflow around the devices to prevent overheating. If you find that your unit is overheating, you may need to remove the devices from their cases. Be sure to verify that the width between the dividers will comfortably accommodate your device with room to spare for adequate circulation. If you need a solution for securely storing and charging your tablets, laptops, and other electronic devices while not in use, this Luxor/H. Wilson LLTMW12-G wall mount charging station is the unit for you! Featuring a padded interior with rubber-coated dividers spaced 1" apart to protect your delicate electronic equipment, this storage box can hold up to 12 tablets or Chromebooks safely in place. Ventilation holes are located on the two side walls of this unit to increase airflow and prevent your devices from overheating, while a horizontal 12-outlet electrical assembly efficiently charges your devices overnight or during off-hours. 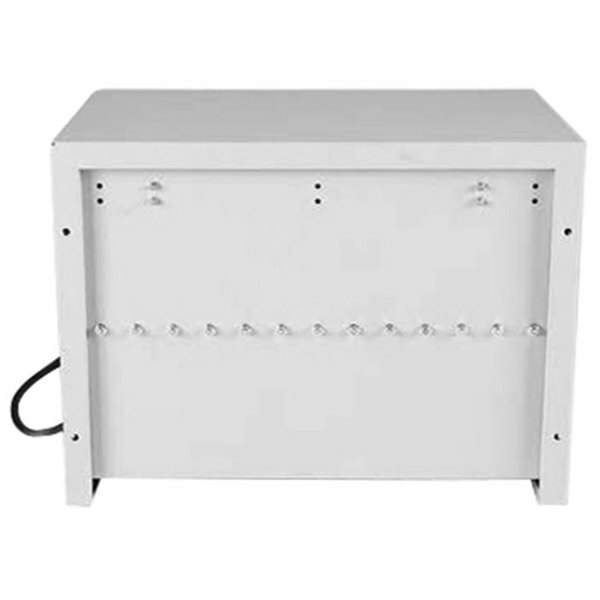 For added convenience, this unit comes fully assembled with all the mounting hardware for drywall surfaces included, although it can also be used as a desktop unit when necessary. 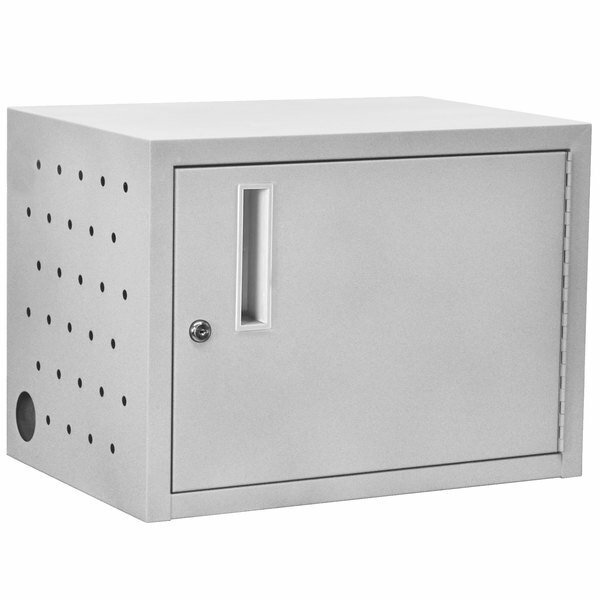 It has a lockable cabinet for additional security and a maximum weight capacity of 30 lb. evenly distributed weight.